John Hovis was deeply depressed following the Australian Open, only now does he feel up to providing his thoughts on the climax of the tournament. Firstly, the men's final. It was boring. Watching two muscle-bound athletes hammering the ball from behind each baseline is not my idea of what tennis should be. The startling lack of variety when Murray and Djokovic play is now sickening. Granted, there is some skill involved. However, huge forehands, huge double handed backhands, the inevitable defensive lob, the smash, the dig-out, then a winner. That's the constant pattern. Yes, he is, though if courts were quicker (as they should be) he wouldn't be getting all these balls back, great athlete or not. For a player to be able to consistently return smashes from opposite ends of the baseline is just wrong. The point should be over and done with. SPEED UP THE COURTS ITF/ATP!! Make all the slams DIFFERENT as they used to be, not all slow to medium paced. End the tyranny of of the dull grinders! 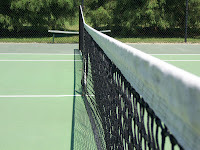 Interestingly, Brad Gilbert stated that the outside courts were noticably quicker this year, yet the show courts remained slow but perhaps very slightly quicker than last year. Could we be witnessing the incremental change John Hovis wants? Let's hope so. Oh, and play with faster balls too. Let's see what Djoko and Murray are really made of. The best match of the tournament by a long way was the Federer/Tsonga QF. Variety, guile, attacking tennis, smiles, enjoyment, the crowd on its feet throughout. Compare it to the second best match, Djokovic v Wawrinka...a fine match, though for very different reasons. Although bitterly disappointed for Stan, there can't have been many people who, even at the darkest moments for Djoko, thought Stan would win. And therein lies the problem for tennis at the moment. Djoko and Murray can outgrind everyone on the tour. And that, my friends, does not make for good tennis or decent competition. The a glimpse of the future was given during the final week of the AO. The Djoko night matches didn't sell out, and few, it seemed had much interest in watching Murray or in backing him within the arena. Murray's camp moaned about the lack of night matches. It was pointed out that he doesn't shift tickets. Djoko tries hard to be a huge character and the new global figurehead of tennis; sadly for him, his brand of tennis doesn't really get the average punter's juices flowing. The Murray / Djokovic duopoly really doesn't whet the appetite of tennis fans, let alone the occasional observer. Returning to the final, Murray's lack of ability to change it up and become more aggressive when required has cost him dear again. It may be that Djoko is now inside his head just at the time when he seemed to get several monkeys off his back. He's still got a lot of work to do. 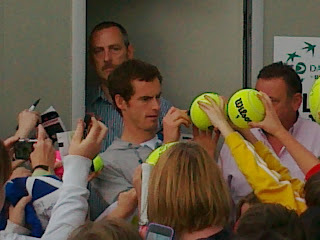 Murray signing stuff following a Davis Cup tie. Copyright John Hovis. What of the other players during the final stages of the AO? Sadly my women's picks were all wrong...mainly due to injury. Serena was untouchable: bad luck thwarted her. The women's game still has a long way to go to come close to her. As for Sharapova Nova, again her flawed serve and temperament on the big occasion let her down. Well done to Azarenka for retaining her title...fairly uninspiring tennis though. As for the gents, those pundits who have long championed Ferrer's achievements need their heads examined. Again, when he gets close, he's got nothing. His distance from the top four remains enormous, as he himself admits...Ferrer admitted that with the big four in a slam, he's got no chance of winning it. That the world No.4 admits to having no chance at Slams shows that tennis has some serious strength and depth problems. As for the GOAT, Fed showed that his tennis is still fabulous and he's in good shape. A tiny touch slower, not as powerful as the top two hulks and a little more erratic with age. He's still a major threat and with more consistency throughout the final week of Slams could easily allow him to take home more titles. As Fed gets older and looser in the latter stages with the career pressure now being off, the Murrays and Djokos won't want to face him in SF's. With the courts still so slow, Wimbledon, with shorter points should still be his best hope. Also good to see a resurgent Tsonga, playing good stuff, entertaining and with stiffer resolve. Could be a good year for him with Rasheed at the coaching helm. Disappointing from Berdych, Delpo, Tomic, Raonic, Nishikori and especially Dmitrov. Long way to go for these guys to get near the top four. More work, more belief and stronger stomachs for the battle required. A very surprising tournament from Simon, Monfils, Chardy and Almagro. Yet again, the lack of self belief and the unwillingness to dig in and battle is stark. Almagro's loss in particular should have his coaching staff in tears. Next up: Davis Cup aftermath.